With Selective Compare, you can see the changes between snippets of text or code or compare two versions of an image or a table without the need to redline an entire file. You can copy the content from anywhere - including emails, chats or files - and compare it in seconds. 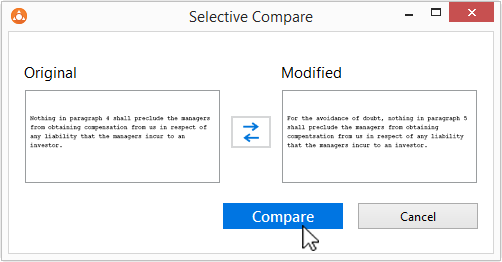 Selective Compare is available from the Workshare tab in Microsoft Word and the results are displayed in the familiar Compare environment. PowerPoint comparisons are now saved as WCFP files to avoid any conflict with the WordPerfect WPF extension. The WCFP file type can be opened in Workshare Compare for PowerPoint. The NetDocuments ndOffice MSI is no longer included in the Workshare installation bundle, so you must now install ndOffice to use the Workshare NetDocuments integration. We made this change to ensure you have the latest version of ndOffice installed rather than the version that was relevant when we released. See the full list of bug fixes and performance improvements in the Release Notes. Additionally, the desktop app has been updated to the newest version, 2.25. Workshare 9.5.3 is available as a full install (there's no update bundle or patch yet), which you can get by clicking the Download for Windows button in the Download Center.